It’s simple math, really. 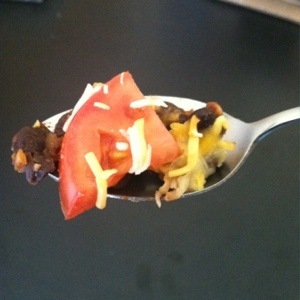 A low bank account, a healthy diet, and a sale on black beans results in a quick lunch with a lot of fiber. I also ended up with a pretty full belly with just one can of black beans (315 calories). Threw in some spices, a tomato, and a splash of shredded cheese and you’ve got yourself a lunch. It also inspired another dish with avocado, but I’ll save that for another day. In a saucepan on medium heat, warm extra virgin olive oil. Drain and rinse black beans, add to pan. Cook for 5 five minutes, add water and spices. Cook down until water has been soaked up by the beans and beans are thoroughly heated. Take off the heat. 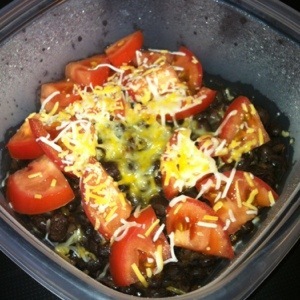 Top with shredded cheese and a diced Roma tomato. I refrigerated it at this point so I could take it to work, but you can eat it heated right after cooking. Enjoy.